In Mexico there are fabulous tourist destinations that, even though they include the Spanish word for Christmas in their name, don't feature Santa Claus or little elves making toys; in fact, they offer tropical sunshine almost all year around, a fresh breeze every afternoon, and spectacular beaches and marinas, among other attractions. Isla Navidad (Christmas Island) and Barra de Navidad (Christmas Sandbar) are located opposite each other in the tourist area known as Costalegre and are perfect places for enjoying your summer! Barra de Navidad is a small port right in the south of Jalisco that is bordered by the Pacific Ocean and the San Cristobal Lagoon, which is also known as the Barra de Navidad Lagoon. The wonderful tourist complex of Isla Navidad is located to the west of the port, offering beautiful views of the Pacific Ocean. As one of the most exotic and paradise-like attractions of Costalegre, Isla Navidad features coral reefs, spectacular cliffs, magnificent beaches, an incredible tourist development with a 27 hole golf course that’s among the best in the country, and tennis courts, as well as the impressive hotel Wyndham Grand Isla Navidad Resort, with its outstanding restaurants, bars, spa, nightclub, and other excellent facilities. But where does the "Navidad" (Christmas) part come from? The city, lagoon, and island have had that "last name" since they were discovered in the 16th century by the Conquistador Antonio Mendoza de Pacheco, who was to be the first Viceroy of New Spain. He arrived at this paradise-like region on December 25th, 1541, Christmas Day, hence the name. With such historic value, beautiful natural attractions, and modern infrastructure, Isla Navidad is a fantastic place to visit during the summer. Here people from around the world come to admire the incredible sunsets, scuba dive among the reefs, and explore the region with a Barra de Navidad tour while enjoying an unforgettable vacation. The best way to get to Isla Navidad is from the city of Manzanillo, which is about 40 miles, or about an hour southeast of the island. 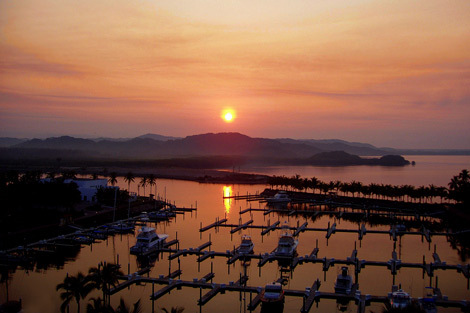 If Manzanillo is your final destination, then you can discover Isla Navidad as one of the many major attractions close to Manzanillo. Don't wait any longer to spend your summer vacation on Isla Navidad!